Today marks the start of an ancient festival of interest to wine bloggers and readers: Bacchanalia. 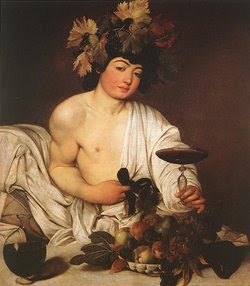 (Bacchus, by Caravaggio) Unbelievably, given its meaning, Bacchanalia has not yet been used as a wine blog name...at least not as far as I can tell. Celebrated in groves near Rome's Aventine Hill on March 16 and March 17 (presumably by those who got through the Ides of March), this pagan festival celebrated the ancient god Bacchus. God of wine and fertility, Bacchus became a popular symbol of debauchery and excess. If you don't believe me, type Bacchanalia into Google Images and see what pops up! Originally, the festivals were only open to women and happened three times a year; then men were admitted and they started happening as many as 5 times a month! The cult grew so popular that the Roman Senate banned Bacchanalia festivals in 186 BC. With all the green beer that will flow tomorrow, it's nice to know that wine drinkers, if they prefer, can hoist a glass to Bacchus, rather than St. Patrick. Of course, you could make the celebration a two-for-one, and serve beer and wine, and have a round of toasts. Happy Bacchanalia! Hi Debs - you have to slow down - I go away for a week and you write the Oxford Wine Companion! Anybody up for green wine? I think I will mark this in my calendar for next year - Cheers!